(CNN) -- Minnesota's Canvassing Board voted unanimously Wednesday to reject a request from Democrat Al Franken to count thousands of rejected absentee ballots in the recount of votes in his Senate race against Republican Sen. Norm Coleman. Republican Sen. 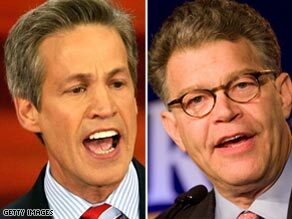 Norm Coleman, left, has a slim lead over Democrat Al Franken in Minnesota's Senate race. The board, which oversees the recount, said it was not rejecting the merit of the arguments made by Franken's attorneys, but it said the matter fell outside its jurisdiction, as Coleman's lawyers had argued. Board members acknowledged that the issue likely will end up in court. Some 12,000 absentee ballots were rejected from the initial vote count because of technicalities and errors. Unofficial results from the November 4 election put Coleman, a freshman Republican, 215 votes ahead of Franken, best known for his stint on NBC's "Saturday Night Live" and as a former talk-show host on progressive radio network Air America. The slim margin for Coleman, less than half of 1 percent, triggered an automatic recount, marking the first time there's been a recount of a U.S. Senate race in Minnesota. Franken's campaign said some 6,400 of the rejected absentee ballots were thrown out for invalid reasons. Coleman's team argued the board didn't have the authority to include the disputed ballots in the recount. The hearing came as the number of ballots being challenged by both camps is growing. The secretary of state's office reports that 3,594 ballots have been challenged so far, with 1,836 questioned by Coleman's camp and 1,758 questioned by Franken's. Election officials at 107 sites across Minnesota have recounted more than 80 percent of ballots, surrounded by election observers and attorneys from both campaigns and the media. The recount started a week ago and could extend into next month. When comparing the new tallies with the results from November 4, it appears Coleman's lead now stands at 238 votes. With the margin between Coleman and Franken remaining so close, the status of ballots challenged during the recount and disputed absentee ballots could be crucial to the outcome. Democrats so far have picked up seven Senate seats in this year's election, with seats in Minnesota and Georgia still undecided. In Georgia, freshman Republican Sen. Saxby Chambliss faces a runoff Tuesday against Democrat Jim Martin, a former state lawmaker. If the Democrats take both remaining contests, they'll reach their pre-election goal of controlling 60 Senate seats, a filibuster-proof majority. A filibuster is a move by the minority party in the Senate that could bring the chamber to a standstill by blocking votes on legislation.